Online Backup is becoming an increasingly popular service for businesses. With 80% of businesses closing within 12 months that have suffered a major data loss, it’s easy to see why that’s the case. It’s now more so than ever incredibly important to keep your data safe and secure. Your Telecom’s Online Backup solution allows for your business critical data to be backed up securely off-site across multiple geographically diverse locations. This is done by installing a small piece of software on your operating system or server which sends your data over a secure internet connection (or possibly privately) once a day (or more if need be) to our enterprise class data centres. 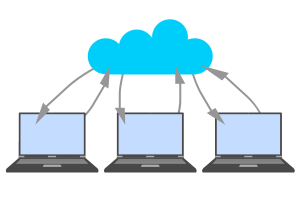 Online backup or any kind of cloud backup as a service works well as an alternative or even an addition to traditional on site backup solutions for businesses that are looking for higher levels of backup redundancies. With there being many different online backup products on the market, it’s sometimes difficult to decide which service is right for you business. What’s important is establishing how important the data that you are intending to backup actually is. Implementing online backup with Your Telecom results in the following benefits. The first being the level of service itself. Our customers get access to an online control panel where protection of certain files and programs can be managed. The data is securely sent to two UK data centres via a carrier class private network and then stored on highly protected storage. Which is why we can guarantee the availability of your data whenever you need access to it. Our online backup service has also been specifically designed with efficiency in mind so that our users benefit from an overall reduction in storage costs. Before the data is sent to our storage facilities, the data is compressed and is then checked for any data duplication. This significantly reduces firstly the amount of data that needs to be sent, but also makes the backup itself less bandwidth hungry. The system is also capable of checking that every time the online backup is scheduled only changes or new data is backed up which means far lass data is stored overall which reduces the overall required storage significantly. Secure Online Backup for Business! Security is another big plus with Your Telecom’s online backup service. As mentioned previously your data would be stored in two geographically diverse locations. The data centres in question are tier 3 and are manned 24/7 and protected by CCTV which brings is in line with the requirements for the ISO:27001 standard. Your data will of course also be encrypted, by going through 128bit SSL encryption prior to any transit. The hardware we use is enterprise class and your data is again encrypted at 256bit once it’s arrived. All in all, this service is one of the most secure online backup solutions on the market. When the restoration of files and data from your online backup is required, the process is very quick and easy to implement whilst maintaining very specific security standards. Restorations can be applied at any time to any location and you have the ability to not only restore files and folders, but also full applications. With our online backup you also have the ability to complete full system restoration, so if a whole machine is lost, it can easily and quickly be restored, which is important form a business continuity perspective. We offer full support for implementation of our online backup for servers, laptops and desktop machines on all major operating systems including Microsoft Windows, Linux and MAC. If you are looking to implement online backup for virtual machines, support is also included. Your Telecom are currently offering a 30 day free online data backup trial. You will have full access to your own online portal as well as unlimited data usage for a whole month. Please complete an online enquiry form if you would like signup for a free online backup trial. If you are looking for online backup for resellers, then please call our partners team. If you are concerned at the level of security of your business critical data then call us now or email email solutions@your-telecom.co.uk and we’d be happy to discuss if online backup is the right solution for you!